Sony’s EXview HAD II™ boasts higher saturation signal level, increased signal output level, reduced smear and noise, with a minimum sensitivity rated by Sony at 1000 mV/µm² sensor area (Conditions: Color@F5.6/BW@F8 in 1 s accumulation equivalent). 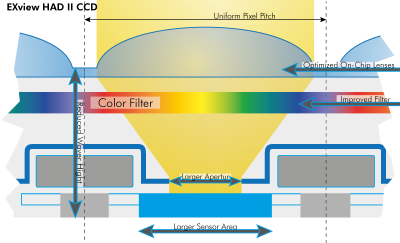 Our own evaluation positively confirms the improved performance of these new CCD sensors. So, what have our Japanese friends achieved? 1. Larger light sensitive semiconductor area. 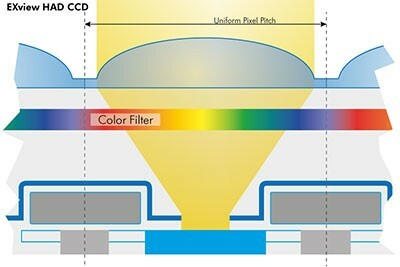 Color detection with a one-chip solution always results in a reduction in sensitivity as light passes the filter mosaic. This loss is typically equivalent to one f-stop. With further optimization, Sony has managed to minimize this loss. The area of the semiconductor material that receives light has been increased, resulting in an improved light-collecting efficiency. With the increase in aperture ratio, the demands on the micro-lenses are lowered. The top surface the CCD sensor has a metal coating, preventing the shift registers from being exposed to light. Over the light sensitive areas, where photons are collected, the metal coating has precise openings (apertures). 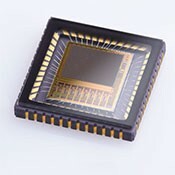 By increasing the aperture size, the ratio of effective vs. non-effective sensor area is improved. One might fear that increasing the aperture size, i.e. minimizing the protective coating area, could lead to spillover of photons, effectively increasing the risk of light penetrating the CCD shift registers. This has, however, proven not to be an issue. Da die Detektion von Farben bei Ein-Chip-Lösungen immer mit dem filtern von Licht einhergeht, ist bei Farbsensoren immer von einer Reduktion der Belichtung von min. einer Blende auszugehen. Diese subtraktive Einwirkung auf das Licht wurde von Sony nun weiter optimiert. Sony has reduced the thickness of the oxide layer, the layer immediately below the protective coating, effectively shortening the on-chip optical path. So increasing the photon collection efficiency. With changes to the sensor architecture a new lens structure also needed to be created. The micro-lenses focus the incoming light onto the light sensitive area (aperture) of the semiconductor. The Sony EXview HAD II sensors are ideal for imaging scenes with wide variations in intensity. Also the enhanced Near-IR sensitivity opens up many new possibilities. To summarize, Sony has with great success released a range of exceptionally high-performing sensors. They can be found in these SVCam models: ECO674, ECO695, ECO815, ECO834 and others (in dual und quad tap versions).